WBZ reports Gov. Baker wants to legalize betting on professional sports. Betting parlors would have to pay a fee for the privilege of taking people's money and would not be allowed to conduct wagering on college sports. Andy Metzger sums up Charlie on the MBTA, from the halcyon days of the 2015 blizzards to today. Are the people who voted for Lively anti-Semitic homophobes, too, or just sending a message to Baker? Does it matter? WBUR considers the 37% turnout (98,000 votes) for professional hater Scott Lively in the Republican gubernatorial primary, interviews a leader of a pro-Trump group that the vote might be more of a sign of support for Trump than an endorsement of Lively's campaign to blame everything from the biblical flood to the Holocaust on gays. Then again, she also wonders if Baker is actually a Democratic plant. NBC Boston reports the governor has changed his mind on sending even just a single helicopter and some support staff because of the "cruel and inhumane" Trump, his attorney general and ICE are breaking families apart as they come into the US. Some 27% of the delegates at the state Republican convention in Worcester voted for Scott Lively today, which is more than enough to force a primary with Gov. Baker this September. Lively, who also ran four years ago, really hates the gays, although he says he doesn't want to see them put to death. Lively came up with his gay Nazi theory after he got tired of being called a Nazi himself. WBUR reports the governor's proposal, in response to last week's Supreme Judicial Court ruling, would only be for people who pose a public-safety risk. The ACLU, though, says the proposal is really broader than that. The state's highest court ruled local authorities can't detain people on an ICE request if they aren't facing any criminal charges. Gov. Baker yesterday signed a bit that will let a developer tear down the condemned Winthrop Square garage for a skyscraper that would cast some shadows on Boston Common - but only briefly, and in the winter, the developer says. Read more. The Hill reports on a letter signed by Baker and other governors of both parties on a possible Senate measure that could lead to the destruction of the state's current health-insurance system. The letter comes even as the state House of Representatives was rejecting Baker's proposal to move large number of people off MassHealth and into privately-run insurance plans. WGBH takes a look at the Confederate memorial on Georges Island; reports Gov. Baker would rather have the thing put somewhere else. The Boston Business Journal reports on an announcement by Mayor Walsh and Gov. Baker of a plan that would let students graduating high school in Boston this year to go to one of three community colleges and then from there to a state college or university. Unlike the current two-year city program, the pilot would also cover fees. However, students will still have to come up with money for room and board. State would lose billions in coming years, the Herald reports. And that doesn't include the risks to people who would no longer be able to get coverage at all. Charlie Baker has e-mail, right? Because it seems his constituent-services phone numbers, the ones people have been calling since Monday to ask him to say something, anything about how he's going to protect vulnerable populations in Massachusetts, are now out of order. UPDATE: At a press conference, Baker said the lines are back up. Also, while he wouldn't call Massachusetts a sanctuary state, saying sanctuary stuff is up to cities and towns, he said, "People need to feel welcome here. ... We will not tolerate acts of violence against anyone." 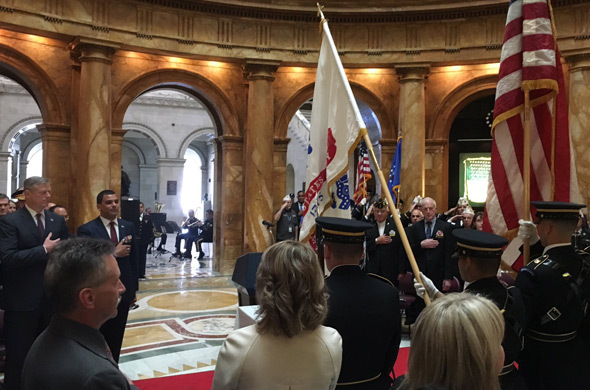 AllstonBrighton Vets attended a Veterans Day service at the State House today with, among others, Gov. Baker, the Ancient and Honorable Artillery Company.